When my son died days after his birth, we weren't sure we would survive as a couple. It was a lovely and crisp day in September of 2008. My husband Brian and I were standing right in front of his grave. Brian was crying. I was devastated. I was also angry at the whole world — and that included the man with whom I exchanged vows. Yes, I was angry at Brian, too. It wasn't supposed to be this way. On January 1, 2008, Brian and I found out that we were expecting our first child. We were ecstatic. My pregnancy had been moving along great ... until that day in April. "I found a problem with the baby's heart," the doctor said. I went home, crawled into bed, and cried my eyes out. It was April 29, 2008, and I thought it was going to be the worst day of my life. I was wrong. My pregnancy continued as normal. Everything was fine on my end. However, my poor baby Liam would be born with heart issues. 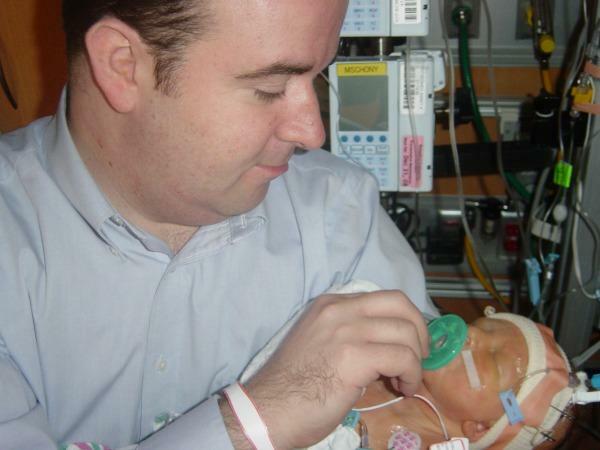 Liam was diagnosed in utero with Hypoplastic left heart syndrome. The left side of his heart was severely underdeveloped. There was no cure. We chose palliative care. Once born, Liam would undergo a series of three heart surgeries. They needed to restructure the heart so the right side made up for what the left side was lacking. I know I should have been positive, but I wasn't. After extensive research, I realized just how serious Liam's condition was. Brian stayed optimistic. I didn't understand how my pregnancy could have taken such a bad turn. Wasn't this supposed to be a joyous time? I worried and felt a lot of guilt. Although the doctors assured me it was a genetic condition, I pondered over what I may have done wrong. By mid-pregnancy, I felt the baby very low and was afraid that I would lose him altogether. I was depressed, very paranoid, and in a constant state of worry. One time, I glanced over at Brian while he was having a beer. I wanted to punch him. I needed a drink now more than ever, I thought. On September 8, 2008, after an induced labor, Liam Jude entered the world weighing 7 lbs. 7oz. They put him right on my chest. I had never experienced a love so strong. They then took him away to the NICU. I will always call it the happiest yet saddest moment of my life. It was so bittersweet. As I had a rougher recovery than expected, it wasn't until hours later that we would finally see our baby boy. He was in an isolette with all sorts of tubes. I cried and cried. I looked at Brian. I watched as a nurse changed his diaper. Did Liam even know who his mommy was? What did we do to our poor little boy? With each day, Liam got better and better. A week later, he would be ready for his first surgery. I remember us all walking with him and then they wheeled him in the operating room. I remember kissing his little foot. I felt sick. In the meantime, we would be doing a variety of genetic tests. Brian thought it was good way of passing the time during Liam's surgery. I felt differently. Finding out the reasons didn't matter to me, as it wouldn't change the diagnosis. Our tests results were inconclusive. I was in shock when the nurse uttered those words just a few days later. "He is well enough so that you can take him home soon," she said. I didn't believe it. He was a tiny baby who just had open heart surgery. How could he be ready? On a more positive note, I got to feed him for the first time. I was pumping and he was ready to eat. He ate like a champ. I was so proud of him. That evening, before we went home, I stopped in the baby store for a few things. I was very worried. Among other things, I picked up a pillow with a monkey on it. It was to help me get comfortable while breastfeeding. I still have that pillow to this day. I think I always will. Brian would be returning the next day to work. We sat and ate dinner. I didn't know what I was going to do without Brian's support. Even though they told me Liam was doing well, I just didn't believe it. I had a terrible feeling. Brian, once again, was totally positive as he sipped his beer. It was the first beer he had since Liam was born. "Liam had a blue episode," the doctor said. We rushed out and got to the hospital. It was then that they handed me my beautiful lifeless baby boy. I got to walk around with him a bit. He was free of the tubes. He would no longer have to suffer. I couldn't believe what was happening. After a few hours, I had to give him back. I wasn't sure that I was going to survive. In the months that followed, Brian and I kept a vigil at the cemetery. We didn't know what else to do. I quit my job and Brian had taken a leave of absence. The holidays were approaching. I pictured everyone else in our lives enjoying the season with their little ones. We should have been, too. Instead, we were in hell. In spite of it all, I decided to make a little card for Liam. In it, I thanked everyone who had been there for us. I included a picture of him. I asked people to remember him during the season. It wasn't long before the gossip got back to me. Some recipients felt that the card was "unhealthy." Others said the tone was bitter and angry. Still, others had a hard time looking at it altogether. I was enraged. We weren't allowed to remember our son? A lot of my anger was directed toward my husband. Most of the people who were offended happened to be his family and friends. I yelled at Brian. I felt as if I had to blame someone. We also had moved from our cute little apartment to a new and strange neighborhood. Brian's friend was the landlord. I was isolated and grief-stricken. I felt as if Brian was only thinking of himself in pressuring me to move out. Brian started mentioning that he wanted to try for another child. I wasn't sure we were ready, but knew that we needed to try and heal. Five months after Liam passed, I found out I was expecting again. I had mixed emotions. As excited as I was, it was painful. We experienced much relief in finding out that the heart was perfectly healthy. This time, we would be having a girl. My depression and anxiety was interfering with the rest of my life. I was living in isolation. I had a lot of anger issues toward those around us. Brian always understood, but he took me aside one day mid-pregnancy. "I understand you're still grieving but we have a new little one coming. She didn't do anything wrong. She's depending on you," he said. Although it was a bit of tough love, I needed to hear it. My best friend and partner assured me that we would get through this together. He had always been by my side. Almost eight years and two children later, the loss still stings. It always will. However, with the birth of our subsequent children, we have two new little people to share memories with. In one of my neonatal support groups, the leader said that men and women grieve differently. They also grieve at different times. It was a tricky process, but we managed to be there for each other throughout it all. I recently asked Brian if would still marry me again if given the chance. Without hesitation, he said yes. He wouldn't do anything differently. The only thing he would change was to make Liam's heart whole. I completely understood, as I felt the same. Sometimes, with love, comes pain. However, if the love is strong enough, you may just make it through. Somehow we did just that.